By following a few key lifestyle and hygiene practices. Want to avoid things like bad breath, rotten teeth and gum disease? It’s time to make looking after your oral health (teeth, gums and tongue) a priority. Luckily, there are lots of ways you can look after your oral health every day, from hygiene practices to lifestyle changes. As well as brushing twice a day, follow our five pointers for keeping your oral health in tip top shape. It’s surprising how much sugar is added to packaged foods and drinks. Even products that boast claims of being healthy or natural can contain a lot of sugar. Frequent sugar consumption is a driving factor behind tooth decay. You can find out how much sugar is in a packaged food or drink by looking at the ingredients list and nutrition information panel on the packet. When reading the nutrition information, look for 15grams of sugar or less per 100grams of the food. You can read more about finding out how much sugar is in food and drinks in our post Avoiding Hidden Sugars. 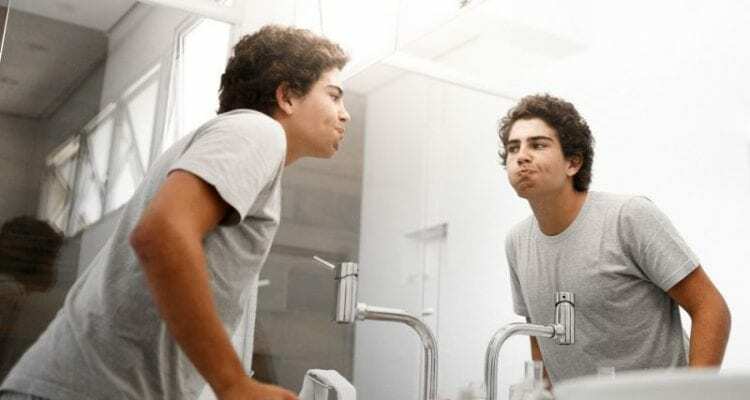 After you’ve brushed your teeth, do you spit and then rinse with water? It’s a common practice, but it actually means you’re missing an important benefit of toothpaste! Toothpastes that contain fluoride work to protect teeth from acid attacks by strengthening the tooth structure. Fluoride also prevents the growth of harmful bacteria in the plaque that accumulates on teeth. If you rinse after you brush, you’ll be sending all that protective fluoride down the drain rather than leaving it in your mouth. Instead of rinsing, you just need to spit out the excess toothpaste when you’re done brushing your teeth. If you’re a dedicated rinser, this might come across as a bit of a shock, but we challenge you to try it for a week and see if you really notice the difference in anything other than the health of your pearly whites. You might have been taught to rinse your mouth after brushing your teeth as a child, but it’s actually better to spit than rinse. If you live in an area with fluoridated water, tap water is about to become your best friend. Getting small amounts of fluoride throughout the day as you sip water provides ongoing protection for your teeth against bacteria and acid. As a bonus – drinking tap water is free, and means you’re not purchasing excess plastic water bottles that are bad for the environment. Some areas of Queensland don’t have fluoridated drinking water. If you live in one of these areas, talk to your dentist about the best way to protect your teeth from decay. Diabetes and gum disease are linked, with poorly controlled diabetes leading to problems with bleeding gums and loss of bone that supports the teeth. It’s estimated that up to half a million Australians have undiagnosed type 2 diabetes, so if you’re reading this and thinking “that’s not me”, it might be time to think again. You can check your diabetes risk on the My Health for Life website (and get free personal coaching on switching to a healthier lifestyle if you need it). If you have diabetes, make sure you check in regularly with your doctor and dentist about managing your oral health with your condition. Quitting smoking is one of the best things you can do to improve your oral health and your general health. Quitting will improve your sense of taste and smell, keep those teeth pearly white and reduce your risk of oral cancer and gum disease. We know quitting can be a challenge, but we can help you give up the cigarettes for good. We’ve gathered all our resources to help you quit smoking on QUIT HQ.